Seems like a long time since I've written a blog on here that wasn't a run down of my Emily Award winning products! I want to send a huge thank you to everyone who took time to watch and share a kind comment... these videos require so much work but it is so fulfilling to find that people really look forward to them and enjoy watching them! I hope the blog posts listing the products were useful to you as well... I think those posts are easier to print off or refer to on your phone when you're out shopping. I kept the hair pretty simple as well- I just did a side part and curled the ends away from my face. 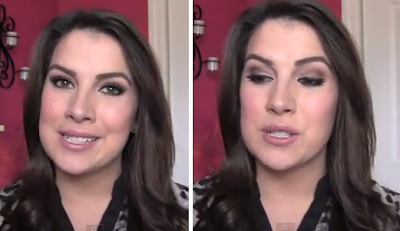 Obviously if you're doing a video all about eye products- you want the eyes to steal the show! That's what I was trying to do anyway in this video. I used my bun maker for a casual updo. As a whole, I was channeling the looks I saw on the Golden Globes in this video. I saw lots of old school, glamorous curls, so I figured- why not try that with my hair! I put my hair in velcro rollers then pulled it all to one side. Makeup-wise, I went for more of a simple, low maintenance eye with no liner in the waterline, and really not much happening on the lower lashline at all. I still went with big lashes, and a light pink lip. 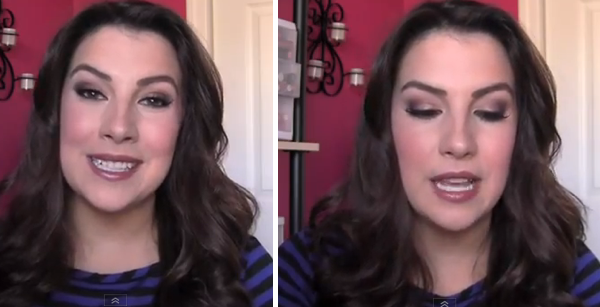 It's amazing how a deeper lip color can change the tone of a whole look! 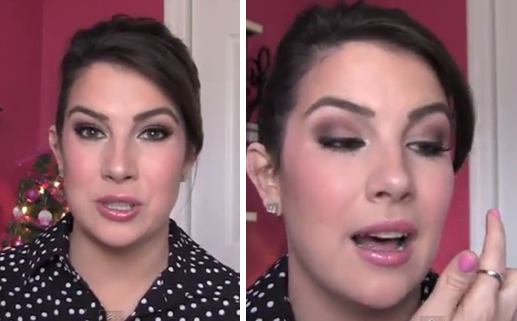 After going with pink lips for the other videos, I opted for not only a deeper lip, but a pretty intense eye as well (excuse my awkward screen shots). I curled my hair all over and went with a center part for something different. We are currently without heat in the house! My little Duraflame is doing a good job for us though. Repairman yesterday didn't seem to have a clear idea of what was wrong, and another guy came today. Looks like we'll probably be getting a whole new heating system. Oh joy. Went to Wal-Mart and didn't expect to find Drew Barrymore's Flower makeup line- but I did! Wowza! I bought some things to review. I'm trying to reply to tweets and I'm incredibly behind due to Emily Awards consuming so much of my time for the past week. Twitter won't let me get back to some tweets from about a week ago that I was trying to answer. So if your question from last week didn't get answered- feel free to ask again. Made chicken enchiladas for dinner- they were delightful! I really need to get the Lorac Pro Palette and the one from the Balm, too. You looked beautiful as always, Emily! First off, thank you SO much for the Emily Awards! I was waiting for them all year...no joke. But I did have one question - are you planning on doing a 2012 Fails video? I find those to be both helpful and entertaining. Thanks again! Can't wait to see your review of the Flower line. Interestingly, my favorite eye is from "lips"! Also, I bought the Neutrogena Color Stick in Raisin today . . . LOVE . . So moisturizing and long lasting which is a rare combo! I want more of those, for sure! can you please do another 2012 fails video like you did last year? Oh, must stay away from Walmart now. Loved the Emily awards. The first time seeing them, but they were so helpful. The tutorials and now awards help me learn about new products and looks without over buying. Tyler is such a doll. Gorgeous!!!!! LOVE your technique, attitude and direction! You go, girl! I'm recommending your blog to my news anchors at WIU, and we are all hoping for a chance to speak to you about your experiences in the media business. Great job on the websites, Emily! Emily I LOVE your blog & videos! Could you post your chicken enchilada recipe too? Thanks for all you do! Take care & hope your heat gets fixed soon. Really lusting after that Balm Jovi palette. My birthday is only a month away! Hope I can hold off! Oh I'm curious about the Drew Barrymore products! 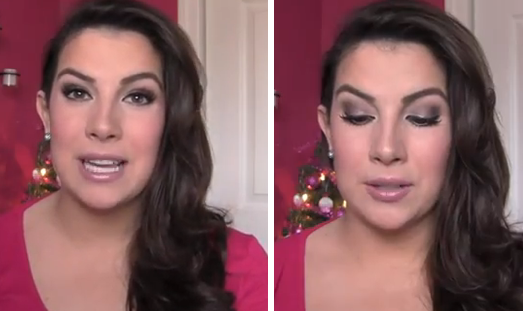 What foundation are you wearing in these videos and the shade? Also what shade are you in the true match powder? Thanks so much! Your videos are so helpful! I'm so excited for the 2012 fails video! Seconding fails videos. Since I noticed you used it and looked great, do you have any tips on how to use the Happy Booster in Natural? I have a lot of trouble getting it to show up on me, and I think we have a similar skin tone. I tend to overdo it with the more pigmented blushes like Wet n Wild, so I thought it would be good for me, but now it looks like I'm not wearing anything at all. So waiting for the Neutrogena Color Sticks to start showing up near me! Hi Emily, I emailed you today at your beauty broadcast email address. Just giving you a heads up in case it went to your junk mail. Subject was " Contact". Thanks! Thank you so much for sharing all this information, and in such a fun way! I cannot imagine how much time and effort must have gone into it all... Much appreciated! good party android emulator if you are utilizing the PC once Showbox for Windows wait as the app will take some time to open up with picked nice. establishes it besides various other video downloading and install apps. Vidmate confirming to be worthy competitors of the application.